The Florida Keys has a huge array of wildlife. This includes below the water and above. They offer one of the most amazing and diverse experiences that can be found anywhere on the globe! Experience the thrill of swimming with wild dolphins in their natural habitat. This is your chance to explore the many shallow reefs, mangroves, remote beaches and the uninhabited back country of the Florida Keys. Below you will find a number of reputable charter companies that can assist you with the most memorable adventure of your lifetime. Sunset Watersports - Featuring Three Tours Per Day! Sunset Watersports features two fantastic deals for a dolphin watching adventure. You can choose between a combination dolphin watch and snorkel trip or a dolphin watch, reef snorkel and sunset cruise adventure. The trip includes free snorkel gear, FREE BEER, and non alcoholic beverages. Your guides will also instruct you if you've never been snorkeling before. The best part of their two dolphin trips (other than the free beer) is that the cost is only an unbelievable $69 per person. You need to reserve you spot in advance, which you can do on-line, or you risk being shut out. Serving Key West Florida since 1992. Our 1800 Atlantic Resort property is located just a few blocks away from Dream Catchers Charters. They specialize in charter excursions and even offer an adults only no rules charter (perfect for Fantasy Fest week). 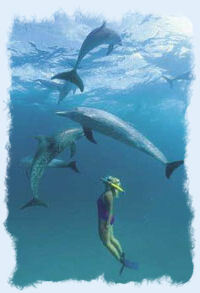 You can swim with dolphins and explore the many living reefs in the Key West area. Most trips last for four hours with competitive prices and custom options available. They and are located at the Sunset Marina and have been in business for many years. Dolphin Safaris specializes and prefers groups of six or less people. This is your chance to explore many of the most incredible back country areas in the Caribbean. They will provide the snorkel equipment, soft drinks, water, fresh fruits and snacks to make your trip enjoyable. They also provide you with a fresh water shower area after your trip. The good folks at Dolphin Watch have been in business for over 26 years. They will provide you with an adventure that you'll be talking about for years to come. 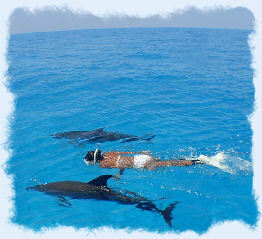 With Dolphin watch you will have the option to snorkel on your Dolphin trip and they provide all the gear. Most trips will take approx. 4 hours to complete. Dolphin watch also offers custom private charters if you so choose. Dolphin watch is located at the Historic Old Seaport in back of the Waterfront Market. Our 1800 Atlantic condo rental is in close proximity to the historic seaport where Dolphin Adventures has their homebase. 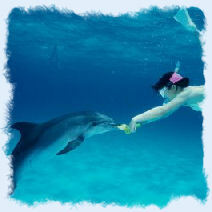 Experience the thrill of swimming and snorkeling with wild dolphins in the warm clear waters of the Gulf of Mexico. We visit the resident pod of bottle nose dolphins each day and explore the shallow back country areas of the Keys. It's truly a tropical adventure that will give you memories to last a lifetime. Echo tours are now one of the most sought after and fun things to do in the Florida Keys. Captain Donna will guide you to the remote back country and show you first hand the beauty of the Keys. There isn't a better adventure available for kids than swimming with dolphins and snorkeling in the shallow waters of the Keys. Packages include: lunch, beverages, snorkel gear, bait, & licenses. Six person max. They have two custom boats available and include snorkeling equipment, beach towels, snacks and beverages with your trip. The Catamaran Echo is the only sailing catamaran in Key West used for dolphin encounters and is known for never being crowded since they only take half of their maximum capacity on their dolphin tours. They provide snacks and beverages with tours lasting four hours. Key West vacation rentals, Key West condo rentals, and Key West accommodations. Key West Fl information on Key West home rental special offers.